PixMag magnifies portions of your current screen in its window. All MS Windows 32 and 64 bit platforms are supported. PixMag is freeware. You may use it without limitations or restrictions. You may pass it on or distribute it freely as long as you do not make any modifications. Reverse Engineering and disassembly are prohibited. We don't take any warranty. Read the LEGAL DISCLAIMER. 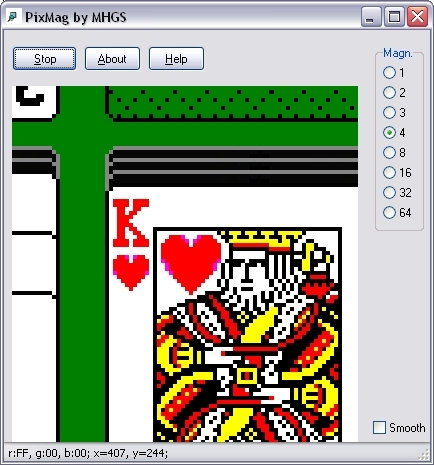 PixMag is intended to be a simple and easy-to-use tool for magnifying parts of the screen. It also retrieves the Hex code of the color of the pixel at the cursor position as well as the cursor position. You can download the zipped executable file (Version 1.2, 410 kB, MD5=301AC783F583DF48F7E42CF03B19614A) here. No setup is necessary. Simply extract the zipfile to a folder of your choice. Click on the leftmost button (Go) to start the magnification mode. Click again on this button to stop magnifying, or press the ESCAPE key. With the middle button (About) you can view the About Screen. The About Screen gives you information on the product name and the current version. Links to our internet page https://www.MHGSoft.de and eMail address mhgs@MHGSoft.de are provided. The Splash Screen is closed if you click on it. The rightmost button (Help) or pressing F1 invokes the help (this file). The radiogroup on the right allows you to choose the magnification factor by simply clicking on it. If the checkbox Smooth is checked the image will be filtered and blured. Otherwise the original pixels are displayed as edged squares. The statusbar displays the hexcode of the color of the pixel under the cursor. The red (r), green (g), and blue (b) component of this color are displayed in hexadecimal notation. The current horizontal (x) and vertical (y) position of the cursor are also shown. If you press F10, the horizontal (Dx) and vertical (Dy) distance to the reference point (where the mouse cursor was positioned, when you pressed F10) is also given. With F11 you can reset the reference point. Choose Close from the system menu or press Alt + F4 to terminate PixMag.